A dry and sardonic sci-fi thriller with the ultimate consequences of climate change. In the not too distant future, thanks to global warming, Montevideo, Uruguay, is a city under siege from swarms of mosquitoes and the deadly dengue fever they carry. 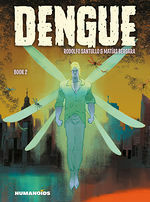 As the diseased bodies pile up in the streets, pragmatic Police Sergeant Pronzini must solve the murder of an esteemed entomologist in order to unlock the true secret of a specific type of dengue infection that may just change the face of humanity forever. At times it’s brutally violent, and it serves as a distressing comment on what we can be. Telling the story in an episodic fashion works to our advantage. Although each chapter can be read independently, they each progress the larger plot. 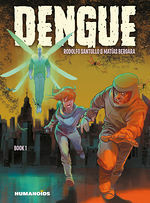 Dengue is a post apocalyptic graphic novel with something new to offer. Dengue demands your attention; a story filled with devastating events that take wild turns.